I Can't Resist the Richesâ€¦â€¦..
With Christmas around the corner, everyone wants to be a little bit richer. Well, to be honest a whole lot richer. But beggars won't be choosy and I am willing to settle with a small windfall of cash to make this holiday season a special one. I like Melina Bingo and for good reason, they are part of the 123 bingo group and happen to be among my favorites. 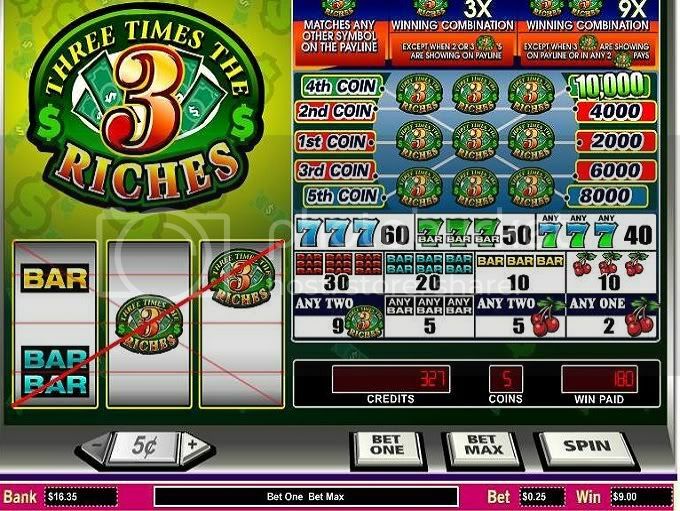 I have not played Three Times the Riches Slot for awhile and really felt like it was long over due. Besides three times richer for gift giving sure would be nice! My strategy with this slot is not to play the lowest denomination because it never really loosens up unless you play a quarter per line or better. So what do I do? Go against everything I believe in and start out playing a nickel per line for a total of .25 per spin. I thought if I start out slow and easy I could boost my bankroll because I am on a tighter budget with all the holiday expenses. I start out with a $30 bankroll and things are not going to good with very small wins that are not getting me anywhere. I was happy and yet had a sinking feeling when I hit double bars and two symbols and only won $9.00. All I kept thinking was what a nice hit it would have been if I played $1.25 per spin. Yep, the ole shoulda, woulda and oughta thinking! After I won this sweet looking screen shot I said to myself time to raise the bet. I moved up to my $1.25 a spin and I never hit another win with even a one symbol. I can't complain and realize we can't win them all and I have had some real good luck on this slot in the past. I guess I will have to try my bingo luck out again soon before Christmas so I can buy those lavish gifts for everyone.